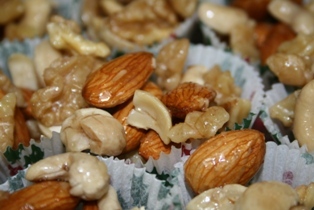 This is Sweet nut mix is quick and easy to make. We used mini cup cake wrapper to serve in. Directions If not using a non-stick pan, coat with cooking spray. On medium heat, cook Mix nuts and agave together till well coated then cook for 10-15 minutes. Stir continually to ensure nuts do not burn. When you can smell the nuts cooking, remove from heat and add cinnamon bark essential oil and stir to coat. Place nuts on wax paper or parchment paper to cool. Nuts may be placed close to one another to form clusters or may be separated.